miniBIGS Minifig Blog: The Big Mak. Should We Be Scared or Hungry? We love mechs. This fast food themed Battlemech aptly named The Big Mak is one of the all-time favorites at miniBIGS. 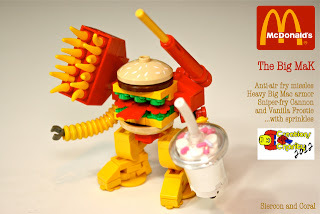 It was created by Sean and Steph Mayo and donated to Creations for Charity, a fundraiser where LEGO builders donate their creations to raise money to purchase LEGO sets for underprivileged children. Unfortunately we did not discover this deliciously awesome mech until after the auction was closed. Now we will just have to jealously gawk at the pic. Oh and just in case the pic isn't enough they also made a video commercial, check it out here The Big Mak commercial.